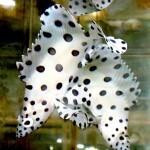 The Panther Grouper, Cromileptes altivelis, has an off white body with vivid black polka-dots. 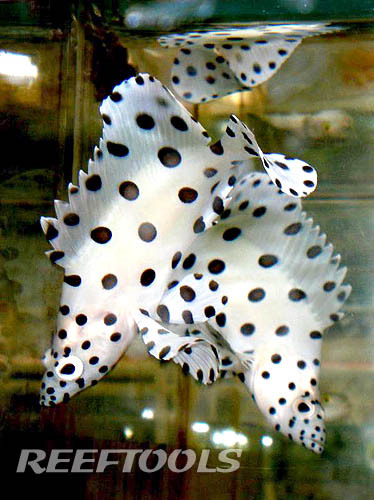 Also known as the Polka-Dot Grouper, this beautiful and lively fish is indigenous to the Indo-Pacific. The Panther Grouper can grow to over a foot, and therefore should only be kept in large fish-only aquariums; 300 gallons or more. As it is an aggressive fish, it is best kept with other aggressive carnivores, like Eels and Triggerfish. 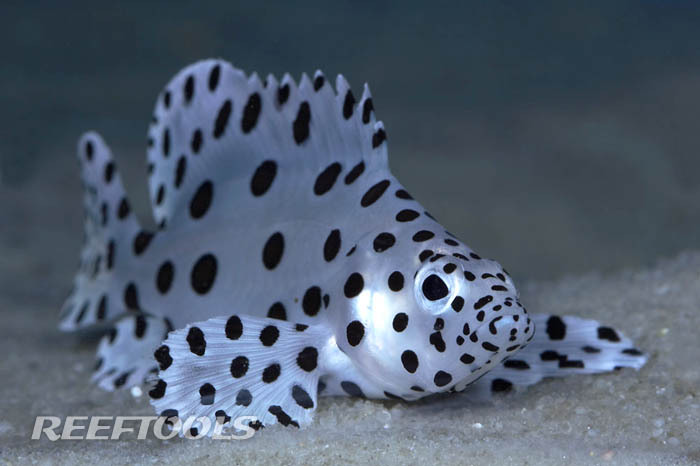 In nature, the Panther Grouper darts in and out of the rockwork with it’s graceful, dancer-like movements, and uses it’s spots as camouflage. Again, this fish grows very quickly, and it is vital that the tank it is housed in offers ample growth room. Although this Grouper most likely will not feed on any corals, it may break or uproot some corals as it chases it’s prey. This carnivorous fish, will most likely eat any crustaceans in your system, and may also feed on any small live fish. The Panther Grouper should be offered a diet consisting of frozen krill or meaty foods like silversides, squid, prawns and fresh fish. I got a cool pic of a pair at A&M a few weeks ago. They are cool looking fish.